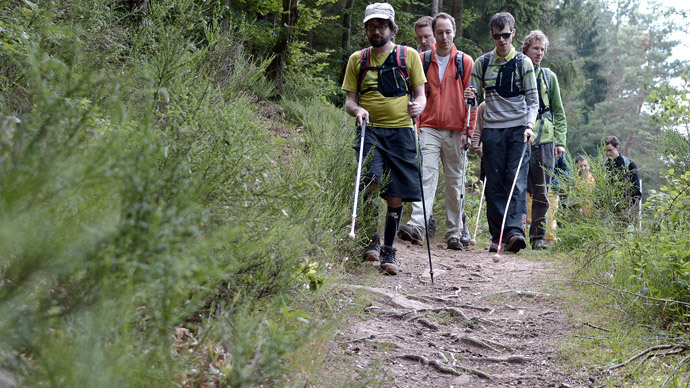 A new smartphone app helped five blind hikers to cross a mountain range in eastern France without any help from sighted guides. The technology offers new freedom to visually impaired people to lead fuller, more adventurous lives. The hikers - some fully blind and some partially-sighted - successfully completed a hike of 80 kilometres (50 miles) in six days with the help of the Navi'Rando app. It creates routes and reads aloud detailed instructions in an electronic voice. It is also able to warn hikers of any potential dangers en route, such as turns and bends. The group had to cross mountains, fields and forests in the Vosges range, which is located near the German border. The name of the app refers to "randonner," (hiking in French). It was developed by a team at Strasbourg University in northeast France. One of the biggest challenges was trying to stay on the path, said one of the hikers. “The thing that's still difficult is using the cane to locate the exact direction of the trail,” Jean-Claude Heim told AFP. The Navi'Rando app is the first to use “inertial measurement units (IMUs) to refine the GPS signal and regularly recalculate the itinerary,” team member Laurence Rasseneur of the university's Sports Science department said. The IMUs devices are use to help guide unmanned aircraft. The next step for the app is to expand the technology’s reach by making sure it works in places with a weak GPS signal, electronics engineer Jesus Zegarra said. After the upcoming improvements, “you could even imagine blind people being able to make their way through the corridors of an underground station on their own,” he said. Navi’Rando has even been used to run a 26-kilometer (16-mile) distance with other participants who had no vision problems. So far, the technology remains at the experimental stage.